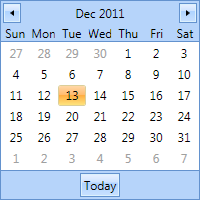 Allow users to select a date using this friendly calendar style control. The WPF Month Calendar is a member of the Mindscape WPF Elements control suite. Provide users with a friendly and familiar calendar control for selecting DateTime objects. Navigate between months using the left and right arrow buttons. Select the current day using the handy "Today" button. Set the culture to determine how month and week names should be displayed. Five included themes - Office Blue, Office Black, Office Silver, Alloy and Alloy Light. Also included in WPF Elements is a WPF Data Grid, Chart controls, Scheduler, Time Explorer, WPF Property Grid,Coverflow control, Multicolumn TreeView, Progress Bar, Slider controls, Masked textbox, RichText Toolbar, Currency Textbox, Integer Textbox, Numeric Textbox, Auto-complete Textbox, Prompt decorator, DateTime controls, Outlookbar control, Color Picker control, Proptional stack panel control, Spin controls and many more!